Twitter is a rapidly growing micro-blogging site that media around the world are using to keep readers informed – 140 characters at a time. That’s what Twitter wants to know, and odds are so do other people. Twitter (twitter.com) is a micro-blogging service and social network that connects people for a variety of reasons. What helps set Twitter apart from other blogging and social networking sites is that user posts (tweets) are limited to 140 text characters. Twitter is a free service that allows you to keep up with what others are doing and they can keep up with you. It’s very similar to the status feature of facebook – without the rest of facebook. People do a lot of different things on Twitter. The majority just update the masses by telling people what they are doing. @sncope Leaving indy. Hear roads are bad. Hope i dont die. @manfull Just about got sucked into “How Clean is your House” on BBC America. That would have been disastrous today. Some use Twitter to draw traffic to their own Web sites or others’ sites. Pop culture icons are tweeting. @darthvader Disappointed that Luke won’t get to be my flunky. Difficult to make someone your right-hand man after you’ve cut it off. @StephenColbert There’s nothing wrong with stretching the Truth. We stretch taffy, and that just makes it more delicious. While we can learn a lot about our friends and what they are doing, get educated about topics that interest us like technology, or simply get a chuckle out of someone’s post, we probably should look most closely at what the media is doing with Twitter. TV stations to newspapers are tweeting and working to keep their readers informed – and drawn to their Web sites. I’m trying to show you that Twitter is a growing tool that student media should be using. After all, our readers are online and living in the social networking world. Instead of fighting that, we need to embrace it. Go to your readers. Don’t make them come to you. For those not on the web, it’s a cheap (free), easy way to get online. All schools have to do is setup an account and begin tweeting. The only real problem with Twitter as a staff’s lone online web presence is that most high school students are not on Twitter yet. However, Twitter can be added to Facebook as an application and Myspace as a widget. Really, most any social networking or Web page out there will allow you to embed your updates. By allowing staffs to embed Twitter as an application on their Facebook profile they can update their Twitter and Facebook status at once (yes, I believe each student media outlet should have a Facebook profile – you can find my students at “Fhntoday Fhn”). Why is updating a status important? Well, you can use it to draw students to your actual Web site or simply give them information they want/need to know — in 140 characters or less. What was the final score of the basketball game? Who was just crowned homecoming Queen? Has school been cancelled? If your staff already has a web presence, the Twitter updates can be embedded on your homepage as well. Twitter is easy to update and can be done a variety of ways. Tweets can be posted on the web through your Twitter profile or through a browser add-on like Twitbin for Firefox. The iPhone and iPod Touch have applications that will update Twitter. Facebook, and many other applications, will allow you to update all your statuses simultaneously. But best of all, Twitter can be updated by sending a text message to your profile. After the initial 30-second setup that is detailed on Twitter.com,you can post updates from anywhere at anytime as long as you have cell service and a texting plan. Used properly, this allows your students to update their Web site, or just get short news snippits to the masses quickly. Can you imagine people checking your web site for scores of basketball games as soon as the games were over because they know there will be an update there – right after the final buzzer sounds? Students could be on their facebook pages and get an update telling them how the band did in a competition three states away. Twitter really could be tapped as a great way to keep your school community informed on all things related to them. Again, it can be done with a cell phone and from anywhere. From an adviser’s standpoint, allowing students to tap into the social networking world can be quite scary. However, the media is evolving (or dying if you follow @themediaisdying – pretty good dose of depression with 99 percent of their tweets) and we need to evolve with it. Find students you trust. Teach them how to be responsible, just as you have with your printed publication or broadcast. Educate them on the potential and let them take off. Here are some great resources for you and for them. I’m still confused, what is Twitter? Like dinner at grandma’s, there is Twitter etiquette. 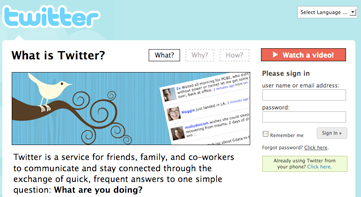 Lots of FAQs can be answered at Twitter.com. There are a lot of great resources out there if you just Google for them. I hope you’re beginning to see the potential Twitter has for your student publications and moving them into 2009. Setup an account, give it a test run, feel free to find me @manfull (I’ll even follow you back) and then move on to help your students find their readers – online.